The 2016 Belk Black Friday ad has arrived, and while the retailer is still not saying what store hours will be for the sale, Belk has announced it will be giving away more than $2 million in gift cards, from $5 to $1,000 (one of the latter per store) to the first customers at each store on Thursday and Friday. The store will also be handing out $10 in Christmas Cash for every $100 spent, and there are coupons for $10 off your first purchase of $50 Thursday or Friday. The 72-page ad is full of deals on a wide array of goods, from assorted boots for less than $20 to buy two, get one free on the entire stock of men’s body sprays, as well as loads of buy one or two, get one free items in the men’s department. The sale starts online at 3 p.m. Wednesday and doorbusters begin at 4 p.m. on Thanksgiving and 6 a.m. on Black Friday, but closing times haven’t been released. As expected, some of the better Black Friday deals are home appliances and tech gadgets. If you’ve got your eye on something with a heftier price tag, you might want to protect your purchase by paying with the right credit card. Some credit cards will pay you the difference if you find a lower price later, extend the product warranty, or protect against loss or damage. Fitbit Charge 2 for $129.99 and Fitbit Alta for $93.99 (regularly $149.99 and $129.99). Choice of small kitchen appliances from brands such as Sunbeam, Oster, Crock-Pot and Mr. Coffee from $7.99 to $19.99. KitchenAid five-quart Artisan stand mixer for $279.99 (after $50 rebate). Five-piece American Tourister luggage set for $99.99 (regularly $260). Smithsonian remote-controlled dinosaur toys starting at $9.99 (regularly $24.99). Sharper Image Nighthawk drones from $29.99 to $69.99 (regularly $79.99 to $199.99). 60-65% off assorted holiday china. Innovative Technology Victrola suitcase turntable marked down to $49.99 from $109.99. 30% off fragrance gift sets from Juicy Couture, Vince Camuto and Calvin Klein. Buy one, get one free on men’s Lee or Wrangler jeans. 50% off women’s shapewear from various makers. $19.99 virtual reality headset (regularly $49.99). Belk’s 2015 Black Friday sale was one for the record books — starting at 6 p.m. on Thanksgiving and continuing overnight until 1 p.m. the next day. In addition to giving gift cards worth up to $1,000 to the first 250 people in line, the retailer offered buy one, get two deals on assorted apparel. The store’s 72-page ad was full of coupons — there was even one offering 25% off anything in the store. 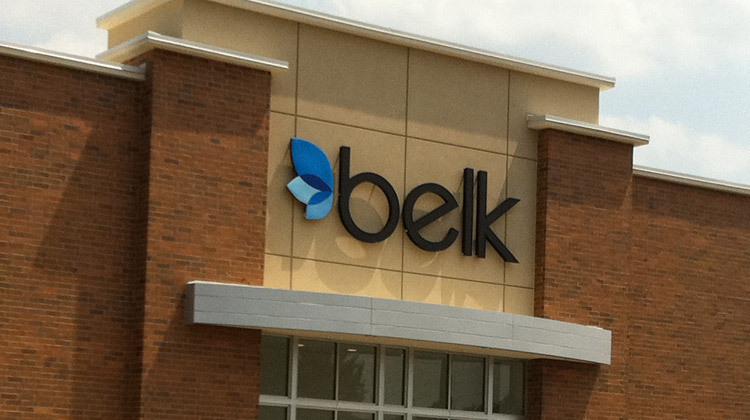 Belk Rewards members did even better, scoring an extra 20% off anything purchased on Thanksgiving or Black Friday, plus five times the reward points on purchases during a certain time frame. 60% off all diamond rings and gold chains. Kids activewear, including Under Armour and Nike, discounted 25%. Buy one, get two free V-neck fleece pullovers for her (priced at $30) and Izod brand sleepwear for him. Calvin Klein down jackets priced at $59.99 (regularly $160). If you like shopping at Belk, you’ll definitely want to check out the Black Friday deals at these similar stores: Macy’s, J.C. Penney and Sears.